Often there is power in saying less. When friends first gave my parents a copy of The Mysteries of Harris Burdick by Chris Van Allsburg in the 1980's the inscription they wrote on the inside said, "Often the elegance of an idea is revealed by the small number of words necessary for it to blossom in the minds of others." Clearly, a memorable thought if I am recalling it thirty years later. So in the spirit of saying less I will get to my point. There is great value in asking students to distill their ideas, information, and arguments down to a single sentence, tweet, meme or phrase. When David was teaching me to say it in one sentence he used an example from the Dustin Hoffman movie Tootsie. David said that script went through several writers and floated around Hollywood for a while until someone (I wish I could remember who) said, "This is a movie about a man who puts on a dress and becomes a better man." With that arc and a goal for the character the script came together and the movie was a hit. One hundred and forty characters is not a lot to work with, but it can be a lot of fun. In 2012 Nicholas Provenzano (@thenerdyteacher) tried live tweeting The Great Gatsby as his class read the famous novel. He had a hashtag for each character and often included their reactions to events in the tweets. Even with only 140, students can capture the essence of a moment, comment on it and share their thinking. Memes combine a few words with and image. They are expected to be funny or make a point. Students can use memes to show their understanding of a topic and also make it a bit irreverent. Memes also get students' attention. 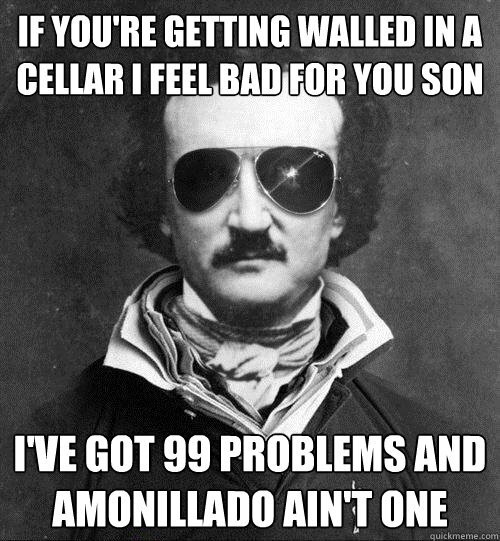 They don't have to rhyme, but I do enjoy using this one after we read Cask Of Amontillado. I've seen students use memes to show their understanding of the Constitution, the Black Plague and The Crucible. To make a meme project more academic have students swap memes and explain in writing what their partner's meme means and what you need to know to get the joke. Think 140 is short, try six words. The six word memoir is a favorite activity for the first week of school. It helps me get to know my students and also gives them a low stakes first computer project as they type and format their memoirs on a single page. Along the way, we learn the importance of proofreading; it's short, there are no excuses for mistakes on this one. And, it's public. It's going on the wall, so make it look good. My favorite end of novel assignment for The Great Gatsby is the art project that represents the novel. (I always offer a range of project options for the end of the novel, but I love when students pick this one.) Students always produce pieces rich with the symbolism of the novel, often creating striking artwork. Then along with their art they must write an explanation of the rationale for all of the details they have included. For some students this becomes their best writing of the year, as they are writing in response to a subject they have thought deeply about, and they are already invested in it. Short form writing is a wonderful way for students to figure out what they want to say and then expand their thinking either orally or with additional writing.